DrawRace 2 is RedLynx's sequel to their original line-drawing racing game, now with better graphics, more courses, a turbo mechanic, and online gameplay. With DrawRace 2, RedLynx has returned to one of their first iOS titles, DrawRace, with a sequel that brings shinier graphics, new gameplay mechanics, and new online modes to the original's "line-drawing meets racing" gameplay mechanic. Similar to the original DrawRace, players must draw lines around the race track in order to determine the racing path. In order to determine speed, players must draw the line faster or slower depending on the speed they want to travel. 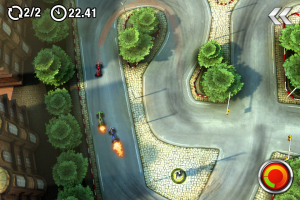 AS well, there's now a turbo boost that charges up as players brake and round corners. The online multiplayer aspects are wonderful. There's a World League mode that features four race challenges that cycle every 24 hours. Players try to raise their skill level by beating the times of at least two players who have higher skill ranks and faster times than them. This asynchronous multiplayer represents the strongest replay value aspect of the game, even more than the lengthy campaign mode. There's also the ability to create custom leagues with Game Center friends to race the best time against them. However, the game doesn't list Game Center friends who have played the game, just all friends, and it can be very annoying when the game endlessly prompts that notifications can't be sent to Game Center friends who haven't played the game. 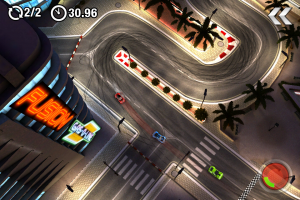 On the smaller iPhone/iPod touch screens, this game is very difficult to play, as there's just not a lot of finger room to draw accurate race paths, especially on more challenging levels. Those who have an iPad would do well to play the HD version instead of this one. Cornering is a very, very difficult art to master, and skidding out of control on tracks is a very challenging hump to get over. It takes a lot of the fun out of this game at times, as it feels like even going slow around corners leads to messing up entirely. It just feels like I'd rather play a real racing game than to leave myself up to the mercy of line-drawing. Between the detailed visuals, great amount of content, and the peerless asynchronous multiplayer features, there's a lot to like about DrawRace 2. However, the gameplay mechanic leaves a lot to be desired. It may just be a matter of whether it 'clicks' with people. It never quite clicked for me, and while I can appreciate the work that went into the game, I find it difficult to recommend, though it's not a terrible risk at $0.99 for the iPhone/iPod touch version, and the asynchronous multiplayer is intriguing enough on its own.